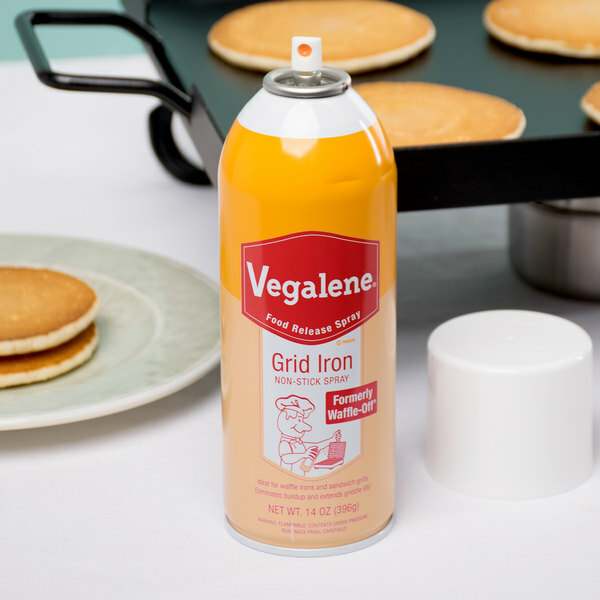 Prevent waffles from sticking to your griddle with the Vegalene 14 oz. 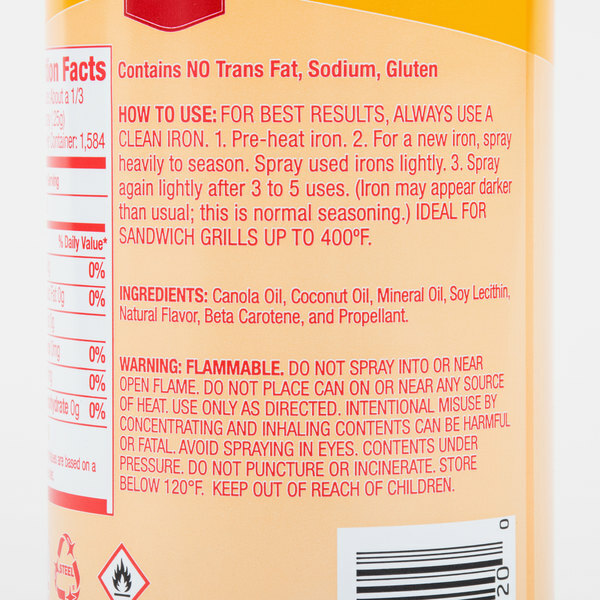 Waffle-Off grid iron release spray. Provide a smooth, fast release every time with Waffle-Off grid iron release spray. It's perfect for your bakery, hotel breakfast bar, or brunch service. With its special blend of releasing agents, this item releases more waffles per spray - even waffles with a high sugar content. Better release means fewer broken waffles and cleaner griddles, so you can serve your patrons faster! "This solved our sticky situation that happened with other non stick sprays. Throw out every other spray, this is the one to buy. No build up and perfect waffles everytime!" This no-stick spray is specially formulated with mineral oil to release your waffles from the griddle without sticking or breaking, meaning that you can produce a greater number of waffles in a shorter amount of time and keep your profits up. 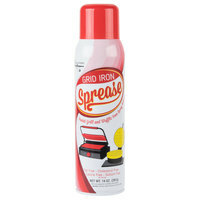 You can avoid spraying the grid iron after each use and expect to produce 3 to 5 waffles per spray. This spray helps reduce the risk of messy, gummy build up, and doesn't leave an unpleasant after-taste on the waffles. Save time, energy, and money with Par-Way Tryson Vegalene release sprays! With a variety of flavors and products to choose from, these food release sprays are superior to other watery release sprays on the market. Save money with Vegalene premium food release sprays! You put everything into your cooking: your passion and creativity. When food is your reputation, don't leave it stuck on the side of the pan. For a clean release every time, trust Vegalene, the number one national brand food release spray in food service. Vegalene is the brand relied on by more chefs and food pros than any other for the last 60 years. Just like you, Vegalene works hard in every part of the kitchen. One of the most important attributes of a food release spray is its ability to cover consistently. Vegalene Premium is a 3-oil blend of canola, sunflower, and soybean oils. No other brand can boast this quality of ingredients with up to 30 present more release agents for superior performance. In fact, the first ingredient in many food release sprays is water, which can lead to poor coverage, running, and discoloration of food and cookware. Vegalene contains no water and releases more sprays per can than competitors, making it the best value in efficiency and performance. You'll use Vegalene all over your operation, including frying pans, grills, baking dishes and sheets, pizza pans, and utensils. It even prevents sticking on slicers, parchment paper, mixing bowls, and hands! In addition, Vegalene Allergen Free helps you keep foods free of gluten, sodium, trans-fat, and the top 8 food allergens. 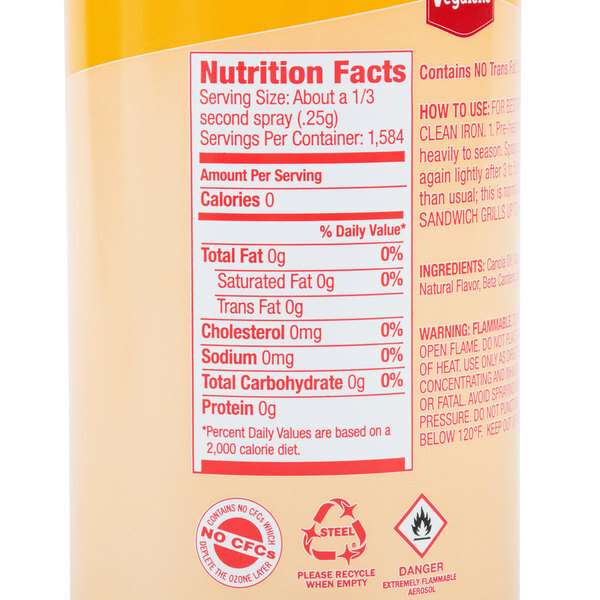 Vegalene Buttery Cooking Spray delivers a rich, buttery flavor that can be sprayed directly onto foods such as grilled cheese sandwiches, pasta, and rolls. 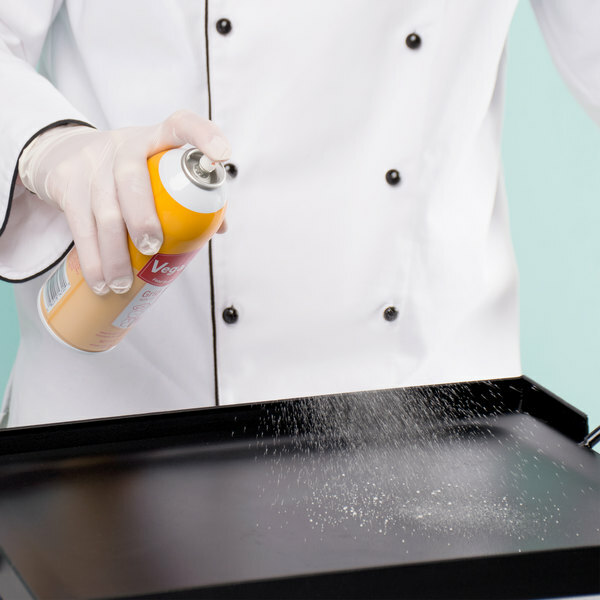 Other sprays can leave white foam when sprayed directly onto foods. 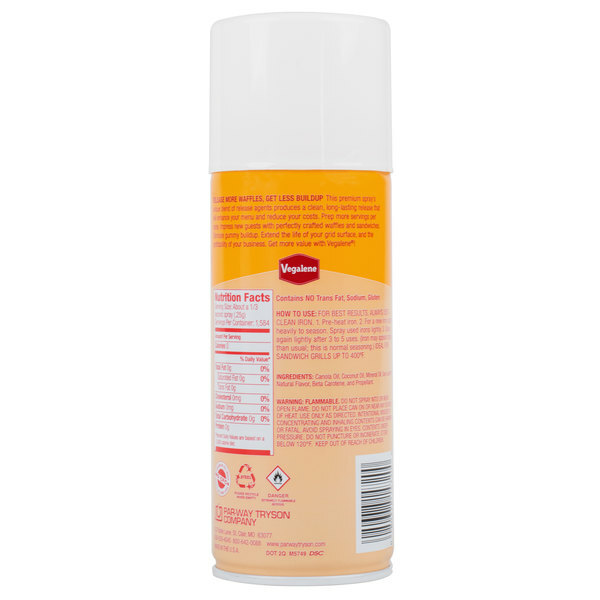 Vegalene Buttery Cooking Spray is Kosher Pareve and meets any dietary need. 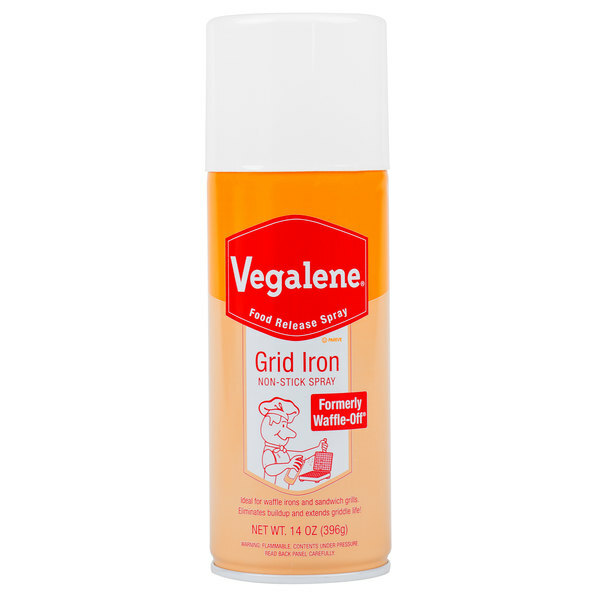 Created especially for the demands of waffle irons and sandwich grills, Vegalene Grid Iron Non-stick Spray turns out perfect waffles and sandwiches every time. With lesser quality products, you have to spray the iron after each use. 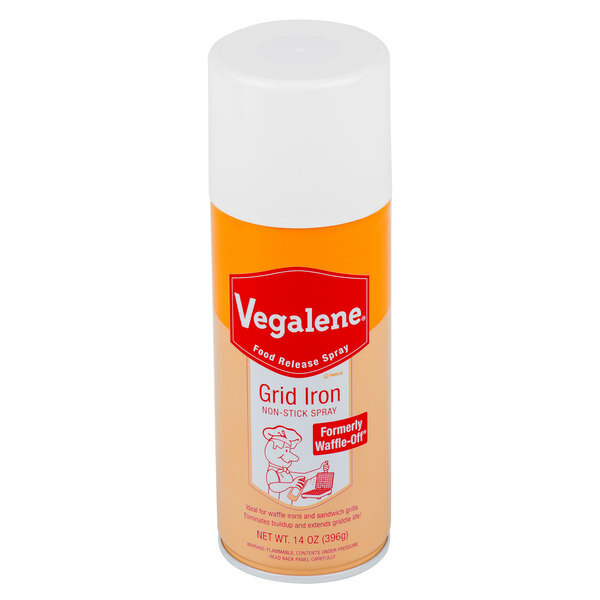 Vegalene Grid Iron allows you to produce 3 to 5 waffles per spray, using about 1/3 less product. Greater yield per spray makes Vegalene Grid Iron Spray the greater value. You'll get the most product usage and trouble-free spraying if you follow these easy steps. Always line up the spray button with the red orientation dot, and hold the can at an approximate 45 degree angle or less. This will ensure that the concentrate is being continuously fed through the dip tube inside the can. If sprayed improperly, you'll run out of gas propellant and the can will stop spraying before the entire product is utilized. You invest time, energy, and money into everything you cook. Why risk ruining it with an inferior food release product? To find out more about Vegalene brand products, talk to your Par-Way Tryson sales associate or visit parwaytryson.com today! With Vegalene premium food release sprays, your dollar goes farther. Get up to 35 percent more yield per can! Our research proves it. 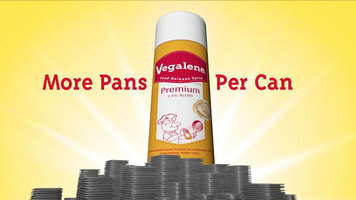 Vegalene--spray more pans per can. Do not buy this product. It does not work. Expensive for what it is. Waffles stick with light spray. Have to spray generously to not stick but then is not cost effective. Thank you for the review Leronce. We’re sorry this has not worked well for you. For an alternative that might better meet your needs, try this Sprease 14 oz. Panini and Waffle Grid Iron Release Spray instead! Great release agent, use on all my bread pans and never a problem with build up or sticking! A clean way to grease pans and not get hands filthy. This spray is the best and we treat it like gold. Has an odd name but if you have a sticky situation, this is what you want to purchase not an off brand. We ordered Vegalene spay for our new waffle machine. Vegalene spray is absolutely the best. We will order nothing else. The waffles come out of the machine with ease 100% of the time. 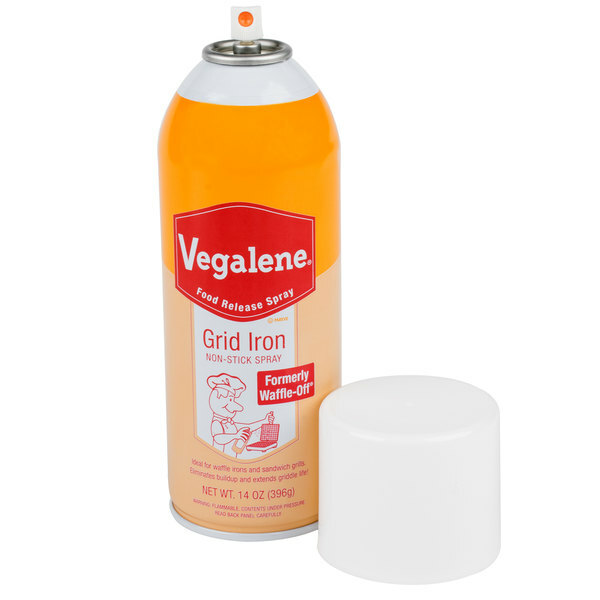 This Vegalene non stick spray is good for pans and also appliances. It keeps the food items from sticking and does not create build up. This product works great! We use this for our waffle feeds at the resort. Without on our old waffle irons it we would have a mess on our hands. We use this product on our waffle machine in the morning. 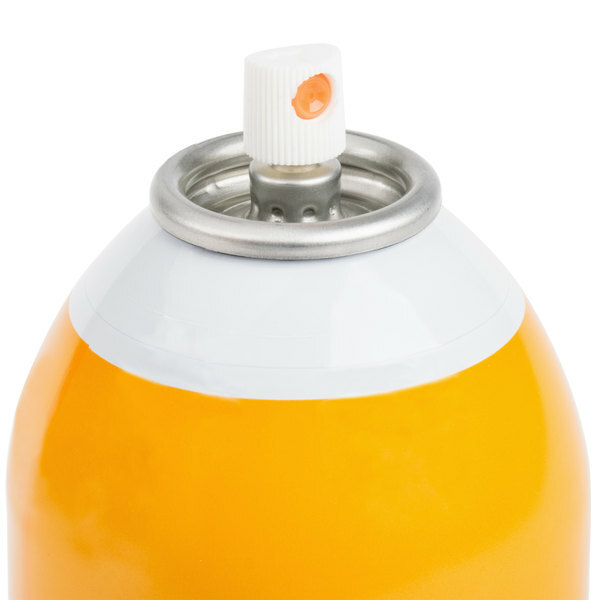 it is an easy product for everyone to use and our waffles are not sticking in the machine, it does however leave a trail on the spray button when it has been used and can make the outside of the can slick. works great for our waffle maker cleaning cycle at the end of business day . It takes only a couple of squeezes of sprays for this product to be effective. Works nicely for my home waffle iron. I get two to three waffles out cleanly with this spray. Much better than all-purpose sprays that need to be used each time, and still stick. We really like this stuff. It is a lot more dense and has a better smell to it than the conventional sprays. This is a decent price too. This Vegalene 14 oz. Waffle-Off Grid Iron Release Spray works better than expected. I have used it on baking pans, and frying pans as well as waffle irons. Clean up is far easier. We looked at a few different sprays to use with our new waffle maker, but this one seemed to be the best fit. We like that it is made specifically for a waffle maker and that it even says it helps protect the plates. This product will definitely help make your life a little easier if your having trouble with your waffle irons sticking, great product will purchase again! So glad I purchased this spray. It worked wonderful on my new waffle iron. I had no problem with any of the waffles sticking and no greasy taste! I can't wait to use this on my pizzelle maker. I'm sure this will be my only cooking spray. This solved our sticky situation that happened with other non stick sprays. Throw out every other spray, this is the one to buy. No build up and perfect waffles everytime! Great for any waffle maker this spray is a must have. Waffles pop right off the iron without sticking and no hassle to clean. Perfect. This product is the best no-stick spray we have tried hands down. It works wonders. It allows for easy clean up and is a great value for what you are getting! Great product in comparison to other similar sprays. 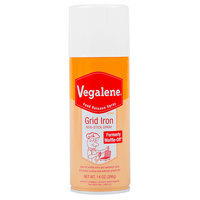 Vegalene spray goes on easy, does not burn or leave any bad reside on the grill or waffle iron, and does not leave any kind of bitter aftertaste on food that some other products do. I would definitely recommend this product to others! Great product that can be use for various cooking and baking needs, it sprays on easy and cleans up even easier, we go thru several cans a month. This stuff really works no question about it. It will keep your waffle iron working with out a hitch. It also smokes a lot less then anything else I've tried. Works great! Only need a little spray to season griddle, and it last all day, waffles dont stick, griddle doesnt get burnt. I highly recommend. Great Value! We use this for our panini grill and it has really helped for the food not to stick. In comes in cases of 6 and have our ours for a few months and still on the first one. This spray is great. I tried using just a regular non-stick spray on my waffle dog maker but the waffles would still stick. The waffles come right off without any problems. This is a great product. Every waffle comes out clean and perfect when I use the Vegalene waffle-off grid iron release. Much more convenient then oil or butter. I love using spray release for most of my baking as opposed to shortening. I feel like it is much healthier for me and everyone else. This is a great product. This is the first time I purchased this brand of release spray and I prefer it over the one I was using. The waffles come out easily and I didn't need to spray as often. Very happy with this product and will be using it from now on. This works just as it states. We make waffles at a farmer's market and use our waffle irons constantly. Since we have switched to this product, we do not have any build up on the waffle iron. Great product. Wax on, wax off! Waffle on, waffle off. What can I say except it is a perfectly adequate means of ensuring easy removal of my waffles after they are done cooking/baking. 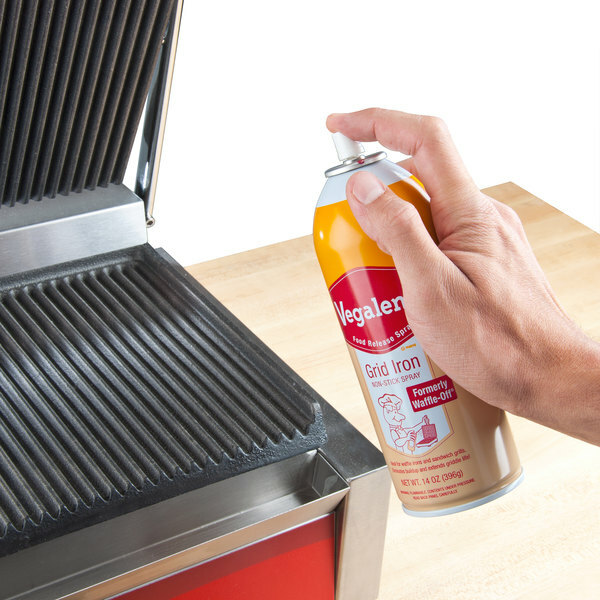 This spray release is great at maintaining a perfect waffle iron! Makes waffles release with ease! Keeps excess batter from building up on your iron!